The goals I have achieved were the ones I worked hard on over a long period of time. And the goals I was able to make time for were goals that faced little time competition from other goals. Meaning I achieved goals when I am not distracted by too many goals. I am naturally a workaholic. So working hard is quite easy for me. I don't need a lot of external motivation to do things most people don't enjoy doing. Also I have a very bad social skills which has the advantage of helping me keep focus. I face much less distraction than most people. Yet with all these advantages, I struggle to achieve some of my goals. It is true that one can't have 100% success rate except one is only attempting very easy goals. But on another hand one can increase his success rate by focusing on just very few goals at a time and over a very long time. Currently, my only outstanding goals are to be fluent in French and be a good web + mobile app developer. I am a little frustrated by my progress but I am not discouraged because I know that I will achieve them. I have scrapped a lot of other goals for them and shrunk my activities pool so I can make out enough time to achieve them. Plus I am not setting a six months target for them. I am willing to give them as much long time as needed to achieve them. 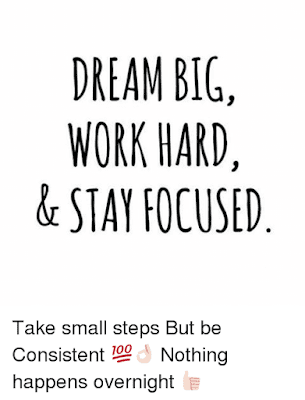 The only aspect I struggle with is the consistent small steps. 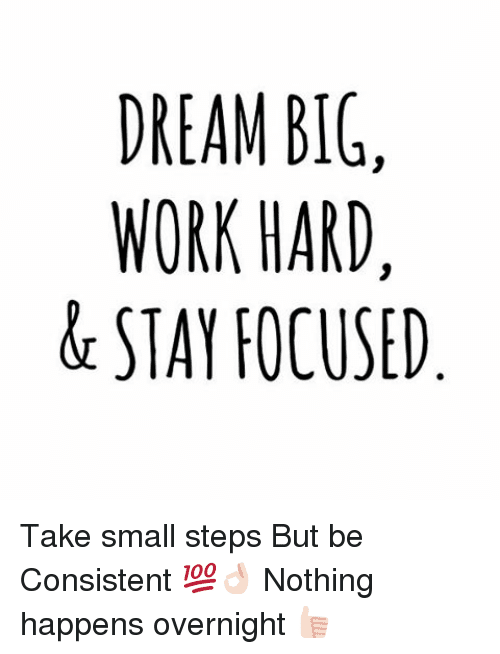 I already take the steps, just that I don't think I am consistent enough. Also, once in a while, I get distracted by other people's success. When I see a child speak both English and French or a very young person doing amazingly well in programming, it brings me low and I begin to think that maybe my brain isn't working very fine anymore.